Whenever the words "crime romance" are used to describe a story it's hard not to think of movies like Bonnie and Clyde and True Romance. Fairly or not, there's some preconceived notions in the minds of readers even before they turn to page one. 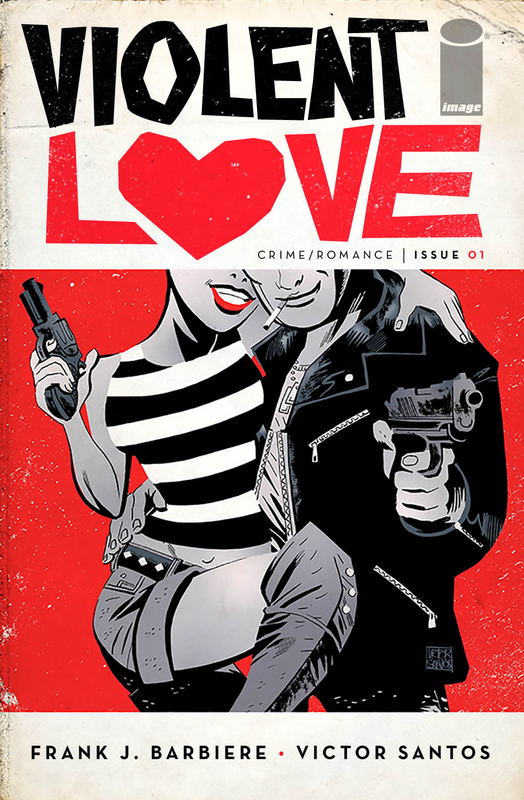 The advantage however of a title like Violet Love #1 by Frank J. Barbiere and Victor Santos is they're able to flesh out the characters over several issues instead of one stand-alone film. They see the scope of this tale but focuses their attention first on Daisy Jane. The story is inspired by true events. We get our first glimpse of the notorious couple, Daisy and Rock Bradley, on a wanted poster in the home of Mr. Lou. The year is 1987 in Texas and Penny has paid Mr. Lou a visit where he recounts his younger days as a lawman and the infamous story of the dangerous lovers. It's an interesting storytelling device to have him narrate the history of Daisy Jane first. The country twang in his voice and the seemingly benign beginning of what's to become a deadly ending as alluded to at the start of the issue sets the table for an in-depth profile of the couple. Jump to 1969, Daisy is much more innocent yet resilient and ambitious. Far from the gun-toting dame, we expect to see later on. She has a great relationship with her father despite his shady past. While supportive and encouraging, her father's past comes to the fore again devasting Daisy in the process. The tone quickly moves from hopeful to shockingly disappointing in Daisy's world. We're also introduced to a number of gangsters but most notably the vicious Johnny Nails. There's a dark side to this small town where bad men do bad things and Daisy unwittingly becomes a witness to some of it. It opens the door to how she meets Rock and become a notorious crime duo. So far we've yet to meet him as Barberie is slowly building his world. He could have easily thrown Rock and Daisy at us in full criminal mode but instead, chooses to humanize these soon-to-be outlaws. He shows a lot of restraint and the book benefits from it, giving us a well-rounded narrative. Victor Santos's art provides the perfect beats to the scenes where a bevy of emotion is needed. Cinematic and heartfelt, Santo's heavy inks and Dylan Todd's expressive designs add humanity to the turmoil around Daisy. The devilish grin from Johnny, the guilt in Daisy's father's face, the pain of betrayal in Daisy's eyes all come vividly through elevating the story with impressive artistic execution. Few stories can convey such doom and gloom in sunnier settings like pulp drama. It can be grim and dark underneath the surface and that's why 'Violent Love' strikes to the bone when things go haywire. Barberie and Santos have my attention. A great piece of pulp to get lost in at just the right moment. We're able to spiral out of control along with Daisy behind the safety of a colorful narrator leading the way. There's still a lot more to find out and 'Violent Love' has me hooked.